on June 23 & 24, 2009. Cover photo by Stéphane Berland. 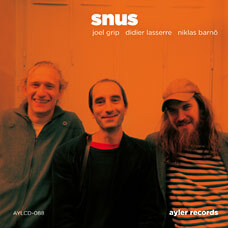 The meeting between the two swedes, Joel Grip and Niklas Barnö, and the frenchman Didier Lasserre, is a clash of free minds, nestled up in improvisation, stating their now’s with a firm but gentle slap in your face. Free music it is, and energ(et)ic all the more. A special blend of free jazz and free improv, a sophisticated mix of talents that tastes different, fresh and highly addictive.